To create the perfect growing environment for your Hydroponics project, and to ensure the optimum growing conditions to produce a beautiful, tender, dirt-free, flavorful product. Although bringing in good bugs to eliminate a bad bug problem might not always solve the problem, you might have to resort to a pesticide. In cases like this, our staff is very educated and can direct you to the best product to use. When possible, it is always recommended to use these guys to fend off the "Bad Bugs" that might take home in your hydroponic garden. The important thing to remember is that these bugs are a protector of your plants and you do not want to eliminate them. Each Aphid Predator larva must eat 10 aphids to reach full development, but will happily eat many more if they are available. Great for indoors because they do not fly toward the light. For a small indoor garden, one release of 100-250 predators will get you started. Many commercial green-houses use Whitefly Parasites as their only whitefly control. These eggs are glued to small cards and shipped ready to hatch and parasitize pest larvae. Use 500 parasites up to four times to control whitefly infestations in a small home greenhouse. 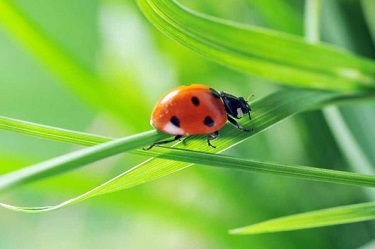 An adult Ladybug can eat thousands of aphids and other pests in its lifetime. Good for small and large areas. This excellent all-purpose garden predator devours aphids, mealybugs, soft scale, whiteflies and the eggs of other insects such as spider mites and thrips. Shipped as eggs, these beneficials are best applied 5,000 eggs per acre. Controls many species of flies by killing their pupae before flies hatch. In its 3-4 week lifecycle, each parasite kills 50 flies. Use anywhere nuisance flies breed. Release 5000 every two weeks for a large compost pile or 3-4 head of livestock. Predators of small insects, these tiny black ladybugs are effective, proven beneficial insects that have been used commercially for over 100 years. They really enjoy mealybugs but will eat aphids and scale when the mealies get scarce. Apply 2-5 per infested plant or one for every two feet of planted area. Repeat about twice a year as needed. Pirate Bugs (Orius insidiosis) are used on many crops to control thrip, aphid, spider mite and whitefly populations. Release 5-10 per 100 square feet. For extreme thrip infestations, use in conjunction with Thrip Predators. A Praying Mantis can grow to be four inches long in just one season and will feed on almost any insect it can overcome. Allow several weeks of warm weather for hatching. Spider Mite Destroyers breed twice as fast as spider mites and eat up to five mites or 20 mite eggs every day! Over time, your spider mite populations will dwindle. To control spider mites in six weeks, estimated use is one predator for every 20 spider mites. Whitefly Predators are fast eaters; they eat one whitefly larva in just 30 seconds. Imagine what these hungry helpers can do for your garden as they munch up to 600 whitefly eggs every day! 300-500 predators cover 1,000 square feet. To use, just shake the predators out of their package onto plant foliage. Predators do best between 65-90 degrees. Nature's alternative to chemical insecticides, Fungus Gnat Predators feed on the larvae of fungus gnats and other small soil-dwelling creatures including thrips, mites, and springtails. Five thousand predators treat up to 200 square feet of growing surface. Predator Mites usually gain control of spider mite infestations after 4 weeks. Release 100 mites per 25 square feet. Predator mites will be effective in a wide variety of conditions: from 55-90 degrees Fahrenheit and from 45-90% relative humidity. These predators feed on immature thrips (soil and leaf pupating) and an occasional spider mite as well. Use 100-500 per plant or 200,000 per acre to control thrip infestations. For maximum effectiveness, humidity must remain between 70% and 85%. Beneficial Nematodes control over 250 different insects in the soil, including weevils, loopers, borers, moths, and fleas. They are harmless to earthworms and leave plants alone. Not to be confused with pest nematodes, beneficial nematodes are parasitic, and invade the bodies of their prey, leaving behind the dead insect carcasses. One batch fits onto a small, 2" sponge and will cover up to 2,000 square feet. To use, submerge the sponge in water and soak into soil with a watering can or pressure-sprayer. Nematodes may also be injected into borer holes with a syringe. If necessary, Beneficial Nematodes may be stored in the refrigerator (40-50 degrees F) for up to 2 months.